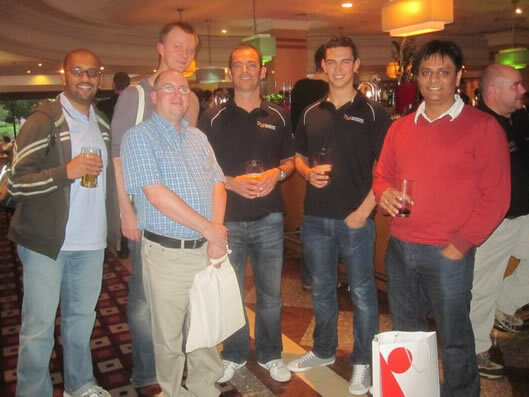 On Saturday 2nd October the UK saw its first SharePoint Saturday event and what an event it was. I want to be completely honest in my post because I feel that is important for the future events and so that people can really see how great the event was and I’m sure will be in the future. The first session I attended was Matt Groves – SharePoint in the Cloud, which gave me a great insight into what is to expect and the future of SharePoint, something I am interested in, in particular the whole BPOS scheme and what I will mean to myself & my business. All in all another polished presentation from Matt. Next was my session, although I had decided I was going to attend Chris O’Brien’s session but I couldn’t because I was presenting myself! Prior to the day I had a nightmare and awoke in a cold sweat, I dreamt that my virtual machine crashed and I couldn’t get it back! So I was pretty nervous about presenting but I was also confident in my subject and like to think I know what I am doing when it comes to SharePoint Design & Branding. 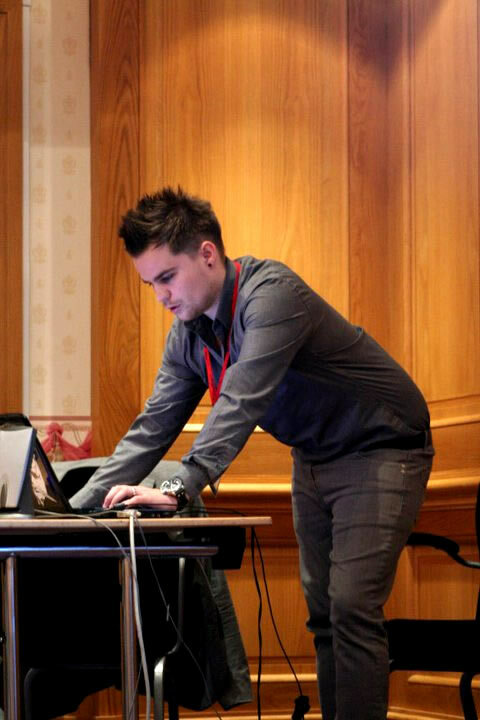 I was lucky enough to do trial run of my session at a recent Manchester Usergroup back in September. My session started with a quick run down about what tools I will using during the session and what I will specifically covering such as changing the top and left navigation, adding a banner, logo and revamping the search . My VM started a bit slow then kicked into gear and allowed me to do a 45 minute live branding session showing you what a small piece of knowledge and the right tools can achieve using SharePoint Designer and CSS. 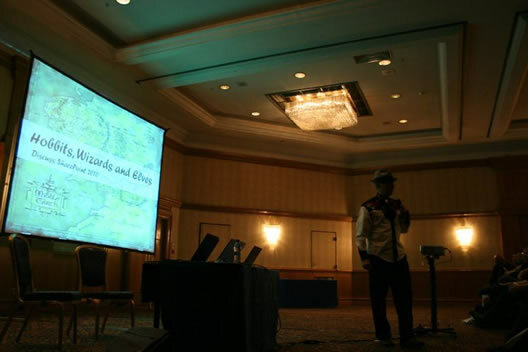 I then wrapped up my session with a design showcase of SharePoint 2010 sites that showed the possibilities of what can be achieved – accompanied with a piece of music made famous by Tony Hart. I think was my session was well received and my session was pretty full – I just hope people enjoyed it but more importantly took something away from it whether that be an insight into SharePoint branding, what can be achieved or even the tips to actually doing it – that’s what makes it worthwhile. On a side note if you liked/disliked my session or you thought of any areas where I could improve, I would really appreciate a comment or an email. Thank you in advance. Me, getting to grips with my slow Virtual Machine! 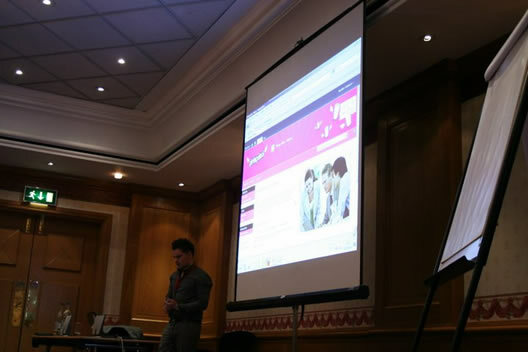 The final product – taking SharePoint out of the box and adding some pink petrol to it! After my session I took a little break and had some lunch, food was good considering the event was free. I had a chat with a few people such as new 21APPS recruit Ant Clay and then planned what sessions I was attending next. 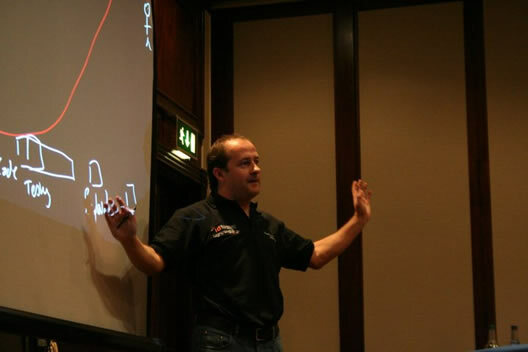 Next I headed to Andrew Woodward‘s session – Real World Sandboxed Solutions. What I loved about this session were two things. Firstly the annotated slides, using his fancy new laptop with touch screen, the interaction was brilliant, sketching out development paths/servers etc – this worked really well. Secondly I loved the crowd interaction, Andrew has this knack of getting people talking, something that isn’t seen much in these type of sessions. The session turned from presentation to group session/conversation and was really well received. The session covered Sandbox solutions – a new feature in SharePoint 2010. Andrew showed us how he, James Fisk and myself developed and built 21SCRUM using a Sandbox solution for the development. At the end of Andrew’s session he gave away packs of his cool 21SCUM post it notes – if you can get some of these (get in touch with him, he may send you some) I would recommend them! After Andrew’s session I took a break and caught up with Mark Miller of EndUserSharePoint.com, a great guy and a key figure head in the SharePoint community. I have a lot of respect for this guy, he beams positivity and is one of those people you could talk to for hours. 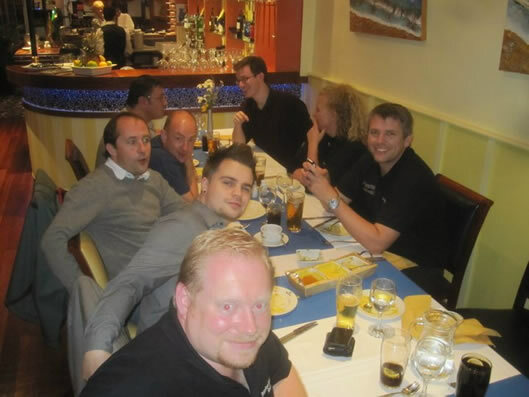 We had a picture together and talked SharePoint – well what else were we going to talk about? Oh yes, his shirts – brilliant. Mark Miller and I – loving the shirt! My final session was Creating an effective and highly developed Learning Gateway for education with SharePoint 2007 and 2010 with Dave Coleman and Mike Herrity. A session I was looking forward to because they were talking about their Learning Gateway in which I designed and branded. The session was a great insight into what they have achieved in the education world, something they are proud of. They showed the live version of their Learning Gateway from back in 2001 and how it has come on leaps and bounds to SharePoint 2010. It was a good session and reminded me a bit of Laurel & Hardy or the Chuckle Brothers? To me, to you! The Dave Coleman and Mike Herrity double act! The conference was wrapped up by Brett thanking everyone and with an ask the experts session followed by I think everyone’s favourite bit – the prizes! The prizes that people could win here fantastic , you had the chance to win an XBOX360, an Amazon Kindle, various book vouchers, USB Headsets, MSDN licences, development books, tshirts and an Apple iPad! I think you will agree some absolutely fantastic prizes but you had to be there to win it! And some poor person chap missed out on the Kindle and some lucky second drawn person won it! I personally didn’t win anything but my friend Peter Oare did – a book and software vouchers, twice! The free prizes – XBOX360, iPad & Kindle to name but a few. So with the first SharePoint Saturday wrapped up it was on to the SharePint! In the bar I had a few beers with some great guys. I met Seb Matthews for the first time, he’s a top bloke and loves Formula 1 and Fulham – someone has to! I also met up with Intelligent Decisioning guys – Mark Macrae, Andy Smith, Tony Pounder and his son Jamie; who all helped putting this fantastic event on. With the SharePint drank Brett Lonsdale, Ant Clay, Matt Groves, Andrew Woodward, James Fisk, Veronique Palmer, Benjamin Athawes, Mark Miller and myself headed into Solihull for a ShareCurry – one of the best curries I have had before! Once that was consumed – I headed home for a much needed cup of tea. So what can I pick at? Again I want to be honest and I think no WiFi was a bit of a problem, however that didn’t stop the constant flood of tweets and updates from the different hand held devices. Water was another one, I couldn’t find a glass of water anywhere! And that is about it – 2 measly picky points from a free event and the first Intelligent Decisioning have put on. Not bad I think. So people there you have it, the first SharePoint Saturday, a completely free event put on by people in their own time to help other learn more about SharePoint and a place where you can gain knowledge, talking to experts and professionals and socialise at the same time – FOR FREE! A fantastic event, a great atmosphere, great content and great people. Thanks for reading, but I want to say thanks to the organisers and thanks to the other speaking for taking time out of their busy schedules to make this great event happen. Thanks to James Love for taking the pictures – the full album can be found on ID Live’s Facebook page. 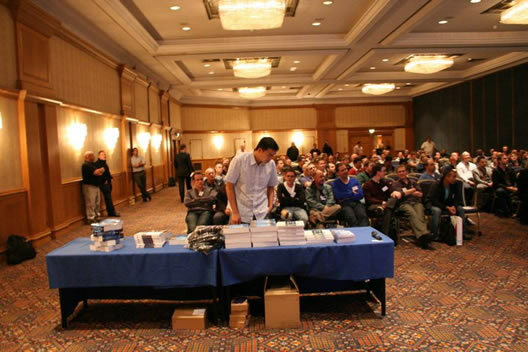 On Saturday 2nd October 2010 the first ‘SharePoint Saturday’ event comes to the UK! It’s based in Birmingham at the NEC (details here), it’s all day and guess what? It’s free, so before you carry on reading – sign up now! or you can find out more by visiting the SharePoint Saturday UK site. SharePoint Saturday is a free SharePoint conference, set on a Saturday, that offers its attendees a range of different 1hour sessions ranging from development & design all the way through to product showcase & architecture best practices. The sessions are presented by all ranges of SharePoint professionals from MVPs to first timers – like me. UK’s first SharePoint Saturday has been organised by Intelligent Decisioning’s – Tony Pounder, Mark Macrae and Lightning Tools’ very own Brett Lonsdale, free of charge and in their spare time so be sure to thank them for there inevitable hard work that will be put in on the day and that is currently being put in getting it ready – thanks guys. I will be demonstrating how a keen eye for design coupled with careful use of SharePoint designer can make your SharePoint site your own! This session will include 15 mins worth of quick fire questions and live, improv branding! Get your questions ready now or if you’re not attending send them through with a chance of getting them answered live! This is a branding, design, look & feel, lick of paint type of session for people that are interested in seeing how relatively small changes can give your SharePoint site a bit of ownership. The sessions are still to be officially announced but here are the confirmed speakers (session details to follow) with links to their blogs. I’m really looking forward to the event, I know it will be a success as SharePoint seems to have such a strong UK community. Before I started working for myself the thought of doing out of hours work, attending meetings or even a conference was something that would make me gasp – “what?! continue working after the hours of 5pm, I think not”. Now I do work for myself and my attitude has taken a complete turnaround and as a by product has made me a better person and I will tell you why I think that. com·mu·ni·ty – a social, religious, occupational, or other group sharing common characteristics or interests and perceived or perceiving itself as distinct in some respect from the larger society within which it exists (usually prec. by the): the business community; the community of scholars. One particular bit stood out to me – “group sharing a common interest” – in this case the particular interest is Microsoft SharePoint. 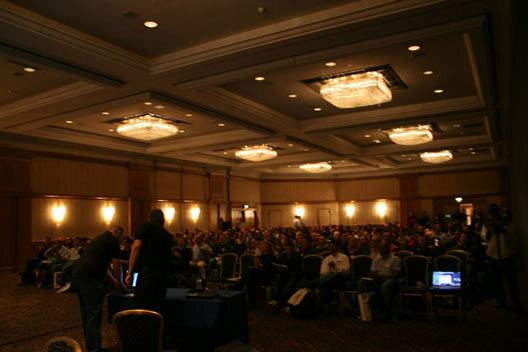 I have been attending these user groups for 2 years now all over the UK in Manchester, Wolverhampton, Leicester, Nottingham to name but a few and I can safely say that when I return home from a meeting I have either made a new contact, discussed something new with someone and most important then, I have learnt something new and/or shared something learnt. The last part of sentence is what sums these groups up – learning something new and/or shared something learnt. So what is a user group? This is a question that I do get asked a lot, when I talk about the SUGUK and when I get asked I see it as an opportunity to tell the person how great and invaluable these sessions are. In a nutshell the SharePoint User Group is a meeting that is held after hours that gives the opportunity to people to talk about all aspects of SharePoint with like minded people. A meeting would last around 2 and a half hours with the common set up usually having two speakers with 1 hour slots talking about a particular area of SharePoint that could range from administrator to development all the way over to configuration & design. Half way through there is a break where food and drinks are put on for free usually by the company that is kindly donating the meeting room or area that the session are presented in – yes for free, you read correctly. Once the sessions are wrapped up the common custom is to head to the nearest public house for a SharePint – the term coined by Daniel McPherson and evolved by Andrew Connell for sharing a alcoholic beverage with the SharePoint twist. Even then it doesn’t stop there because sometimes there is even a ShareCurry – I think that one is self explanatory. Ever been stuck with something? ever opened up that browser typed in the search engine URL and entered in your SharePoint related problem, query or error message – the results you will be presented with were probably written by a SharePoint expert of some sort who, chances are, is a community member. The idea is putting back in to the community what you take out. Putting back in could be anything, it could be blog posts that is highlighted on the SUGUK website, it could be a 1hour session or could be just attending to keep the sessions worthy of a repeat – everything helps continue the community and the development of the product. What you also get from these meetings is exposure to all walks of SharePoint life from server configuration all the way to design and branding then taking a left turn at development life cycles and security. Delivered through the variety of session (prepared in the presenters spare time) that are on offer you can get as much or as little as you wish from them, some sessions are very specific and deep dive into a particular area then others are very overview and skimming the surface. You get the chance to talk to people that specialise in there chosen field whether it be through open question and answer session, a chat over some pizza at break or at the SharePint that follows it’s a chance to ask your burning question to people that know what they are talking about such as Microsoft Valued Professionals (MVP) – we even have some guest speakers from over seas! Who helps run there user groups? First of all the session are chosen from the community – sessions, ideas and suggestions are put out there for people to comment on what they to see. The sessions can be presented by anyone who feels they want to share something with the community. if could be for an hour, it could be for 15 minutes – what ever you are comfortable with. There is however one rule – no business endorsement, selling or sponsorship – it it purely community helping itself, so you wont get business trying to shove their new products down your throat. The sessions are regular with up to 2 to 3 sessions a week sometimes, held all over the UK and are managed by regional leaders. But the most important people there are the people attending to listen, because the more people turn up the more sessions can be held and it makes the nights worthwhile. Also did I mention that the sessions are free to attend – yes you read correctly again they are free! Help, knowledge, best practice, guidance, tips, tricks, how-tos, other peoples experiences, new tools, new features and what is coming up in the world of SharePoint are just a few of the potential things you can take away from the user groups. It is a great opportunity to network, speak to people potentially doing or have done what you are trying to achieve in your business and even if it is none of the previous its a chance to have a nice pint at the end of it – can’t go wrong really. How do I sign up and get involed? If you want to attend then head over to the SUGUK website to find out more information in the forums about what sessions are coming up and all you simple do is sign up by posting saying exactly that. If you would like to speak at a session whether it be something to do with a project you’ve delivered or maybe a tale from the trenches on something that was a nightmare and how you go through it – the community is keen to hear. All you need to do is speak to the regional leaders and they will be happy to discuss further. The sessions are there to help people that are interested in SharePoint. 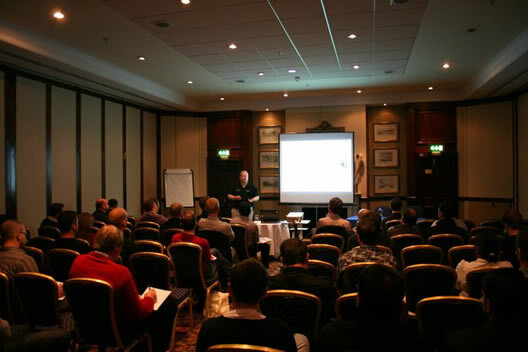 The sessions are presented by experts from people who love the product all the way to SharePoint MVP’s down to the people who are just getting to grips with SharePoint. The session are prepared and presented in peoples spare time and in return they ask for people to continue to attend and help build up this already strong community. There is no pressure to get involved if you feel happy sitting a listening then fine, if you want to present and do a session or look to become a regional leader then even better – the choice is yours. 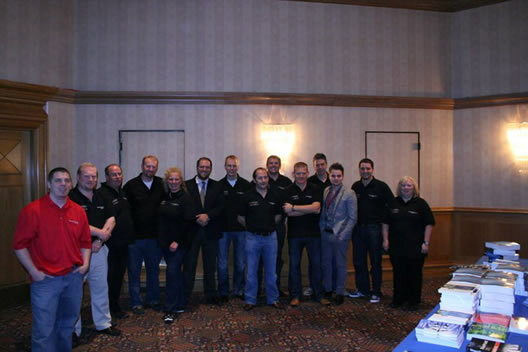 Information about the SharePoint User Group can be found at the official website. Now the reason I think it has made me a better person is simple – being passionate about something and wanting that something to continue to keep that passion – David Brent once said – “There should be no ego when pulling together to do something good” but then again he said “I’ve created an atmosphere where I’m a friend first, boss second. Probably entertainer third.” – so I wouldn’t take the quotes I have used to seriously but hopefully you will get the idea!! On Thursday, 14th January I am doing my first presentation for the SUGUK in Nottingham at Intelligent Decisioning Ltd head quarters in Strelley, Nottingham. I am doing a small session on SharePoint Design & Branding, a little show and tell and my thought process when doing design and branding. The session is called Making SharePoint Beautiful – I hope you can all make it. The user group kicks off with Penny Coventry who will kicking off with “Branding SharePoint Sites: Using the browser and SharePoint Designer 2007/2010”, which will cover what is possible with 2007 in terms of design and a little sneak peek into SharePoint Design 2010. After myself I will be followed by Nikki Ashington on Accessbility. Just a reminder that the Learning Gateway Conference is on the 15th July at The Belfrey in Birmingham. The conference is being held by Richard Willis and Alex Pearce and is design for people using innovative technologies within the education sector. I am not primarily based in the education sector but I do have a keen interest in getting students on board and I love testing out my ideas on them!